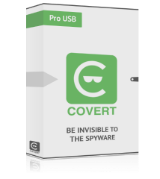 COVERT Pro AEGM 3.0.39.40 was available as a giveaway on March 25, 2019! 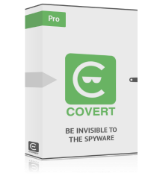 How would you improve COVERT Pro AEGM 3.0.39.40? From the outside looking at the features this giveaway appeared all too good, until reading it’s a 6 month version. But if you’re after an indefinite FREE secure web app similar to this for private use on computers... do a Google search for “Trusteer Rapport” which is offered by many major banks to secure your online banking transactions which can be used in conjunction with basically anything requiring a secure login page like ....Facebook social media, your web email accounts like Gmail, Yahoo, Optus... etc etc. I like the idea this software proposes. The facts are, Windows can never be a privacy based OS, use Linux to even have a starting chance. Oh btw, ever notice the increasing amount of captcha challenges? It's because they are using people to confirm the automation is accurate. They spoke about this on Steve Gibson's podcast (GRC) Gibson Research (privacy experts). I like the idea this software proposes. The facts are, Windows can never be a privacy based OS, use Linux to even have a starting chance. Oh btw, ever notice the increasing amount of captcha challenges? It's because they are using people to confirm the automation is accurate. They spoke about this on Steve Gibson's podcast (GRC) Gibson Research (privacy experts). 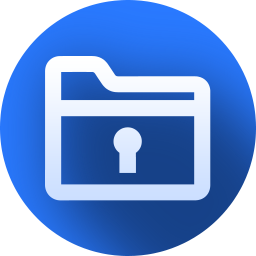 Basically if you shut down the internet and encrypt the file you are working on then send it to a friend who has the key it will accomplish everything this program does. Either use your Internet access option or your AV to temporarily block your internet connection to protect against spyware during the time you are using any of your programs other than your browsers or e-mails. If you're owned, you're owned -- game over. The only sure fire way to prevent network or internet access is to disconnect from the network or Internet. Tester, If you're owned, you're owned -- game over. The only sure fire way to prevent network or internet access is to disconnect from the network or Internet. mike, If you have are on wifi, good luck disconnecting from the internet short of pulling the plug on your router. It's called 'Airplane Mode', and is used a lot on Aeroplanes. Tester, It's called 'Airplane Mode', and is used a lot on Aeroplanes. I use mine on "airplanes"
Othello86, I use mine on "airplanes"
It cant open Chrome browser when logged in. >"All previous versions of COVERT Pro will not be updated anymore, but will work indefinitely until the device on which it is installed is operational." I had to go to the website to see if you copied that correctly, and you did. That is exactly what it says. My concern is the part "will work indefinitely until the device on which it is installed is operational." If I were to install this, I would want to install it on an "operational" device, but then apparently it would no longer work. I don't have a clue how I could install it on a non-operational device, but if I could, as long as it was non-operational, the software would work. I'm shaking my head on this. I'm sure it is a translation error but I do like it. TK, >"All previous versions of COVERT Pro will not be updated anymore, but will work indefinitely until the device on which it is installed is operational." I had to go to the website to see if you copied that correctly, and you did. That is exactly what it says. My concern is the part "will work indefinitely until the device on which it is installed is operational." If I were to install this, I would want to install it on an "operational" device, but then apparently it would no longer work. I don't have a clue how I could install it on a non-operational device, but if I could, as long as it was non-operational, the software would work. I'm shaking my head on this. I'm sure it is a translation error but I do like it. isn't similar to heimdal suite? Each user has unique serial number. Kevin, Each user has unique serial number. Kevin, It's called security through obscurity... of course the default messaging FTP server is easily found AND is NOT any form of encrypted connection so the user name and password used to login is completely visible. So since the server is a standard unencrypted FTP server it WILL be discovered by port scanning BOTs that crawl the public IP space. Personally I have a previous giveaway of this 3.0.31.24 which I think is still licensed and I've not noticed any utility to using this to run a web browser within it... on the basis that this is only a 6 month trial license and I've not found it in any way essential or the secure messaging in any significant way secure i.e. using the default server I can login using an FTP client and delete every message posted by other users so they are not secure. Security is not only that the messages are unreadable by a third party but they are ensured to be delivered and readable by the intended recipient. Which this messaging system cannot do the latter by ANY stretch of the imagination. Kevin, Each users serial is genereated uniquely... but requires you to have prior communication with the recipient to exchange the FTP server URL and login name and password and encryption key and yours and theirs serial codes (as it is alphanumeric not just a serial number). The security of that prior comunication is KEY to any attainable data integrity and security. There is no secure handshake in which that critical information can be exchanged. To date operational message security is far easier to attain with the likes of WhatsApp... but I can't imagine it being considered a true secure messaging app seeing as a data miner like facebook owns it so usage stats and who is connecting to who is likely mined from the app even if the precise message contents is still securely encrypted. Kevin, Each users serial is genereated uniquely... but requires you to have prior communication with the recipient to exchange the FTP server URL and login name and password and encryption key and yours and theirs serial codes (as it is alphanumeric not just a serial number). The security of that prior comunication is KEY to any attainable data integrity and security. There is no secure handshake in which that critical information can be exchanged. To date operational message security is far easier to attain with the likes of WhatsApp... but I can't imagine it being considered a true secure messaging app seeing as a data miner like facebook owns it so usage stats and who is connecting to who is likely mined from the app even if the precise message contents is still securely encrypted.
" I've not noticed any utility to using this to run a web browser within it... "
There's always Ultrasurf, though maybe some controversy re: security, or a non-logging VPN & the TOR Browser for privacy. For protection can always use a VM, &/or there's the new win10 Sandbox, or Defender Application Guard. "To date operational message security is far easier to attain with the likes of WhatsApp... but I can't imagine it being considered a true secure messaging app seeing as a data miner like facebook owns it..."
mike, for the most part the windows based browsers have the potential to be secure enough if correctly configured which is why I find no utility in this program. Browser data leaks are normally the result of overly permissive settings like allowing mixed secure/non-secure content on a given page. Or letting the browser swap from https to http without a warning or use of dangerous add-ins or plugins. Or permitting web browsers to contact 3rd party tracking servers that can also leak data and so on... Sure hardening web browsers can deprettify parts of the web and might block some sites functionality that relies upon loading insecure 3rd party content or risky https 3rd party scripts but that can be a price one is willing to pay for data security and risk reduction without having to trust 3rd parties like one does with VPN's and Onion routed browsers. One can get caught up in paranoia on the web... but in most cases we are just not interesting enough to perform a concerted attack on and the main risks are if we do something stupid like open an unsolicited email attachment or believe that any security software we have installed will protect us from our own stupidty or ignorance, which of course they cannot.